About a week ago a near-tornado roared through my area, wreaking havoc on trees right and left. 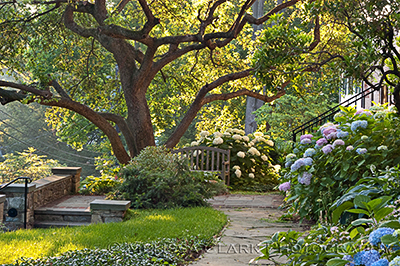 It made me think about how important trees are to a garden’s structure and design. 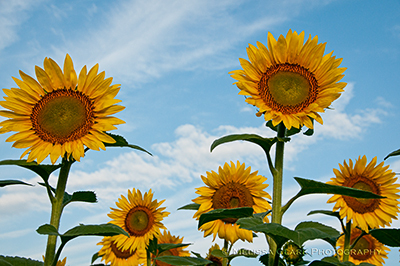 Sometimes they are there when you buy the house, providing shade, a focal point, beauty and shelter. 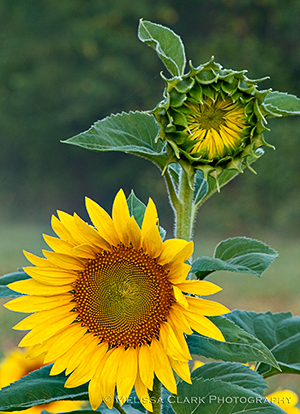 Other times, you add them yourself, choosing what you hope will be a successful addition to the garden. The storm took down two huge branches from my dying American beech tree, but I’ll write about that another time, hopefully later rather than sooner. 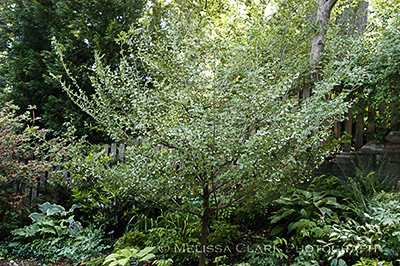 Today I want to introduce at least some of you to one of my favorite trees for shade, Styrax japonicus, or the Japanese snowbell tree. 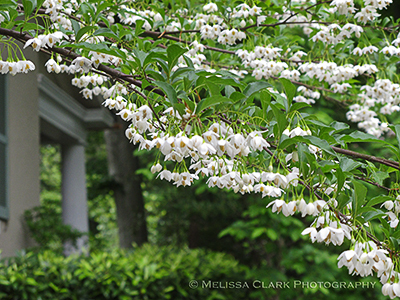 A Styrax japonicus, or Japanese snowbell tree, in bloom in my back yard in May. 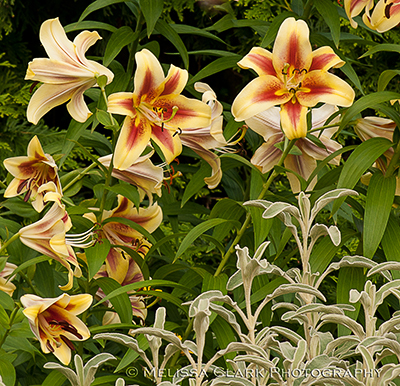 It would stand out more nicely in front of a dark evergreen hedge, but hey, I'm not that disciplined in my own garden. This portion of my garden, although south-facing, gets only filtered sunlight for most of the day because of the high canopy of the many oak trees in my neighbor’s adjacent yard. Nevertheless, the tree blooms prolifically each May (even when we had our 17-year cicada plague several years ago). The blooms look like small white bells, hanging down from the branch, with the leaves perched above the branch. 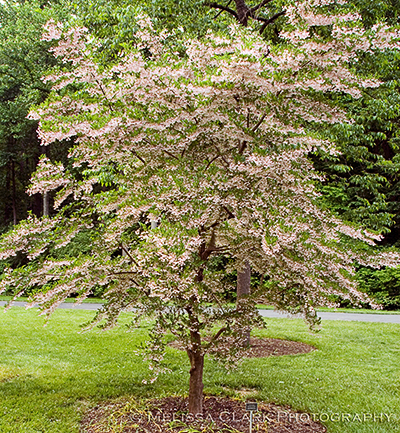 This habit makes the tree wonderful for planting on a slope or above a small retaining wall so the flowers are at eye level. The tree's flowers hang down in tiers, giving a wedding cake layer effect. 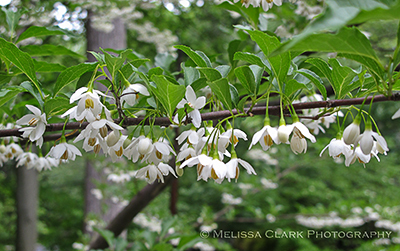 A closer look at the flowers of the Styrax. After the flowers fade, these curious little bobbly 'fruits' remain. I’ve noticed that as they age, these trees can look a little weedy and be prone to suckering – but that’s nothing that can’t be cured by regular pruning, if necessary. So if you have a shady garden and want an ornamental flowering tree that’s a bit unusual, check out the Japanese snowbell. I don’t think you’ll be disappointed. Several weeks ago, having not picked up my camera seriously in a while, I decided to make a dawn run down to the Mall in search of architecture to photograph for an upcoming themed competition at my camera club. 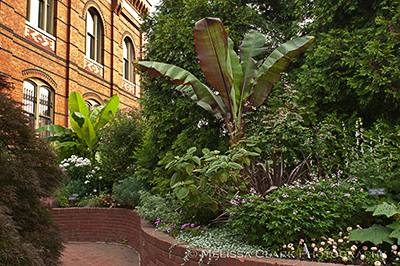 After spending some time outside the National Museum of the American Indian, I headed for the Enid Haupt Garden, the most well-known of the Smithsonian’s garden spaces. On the way, however, a funny thing happened – I discovered the Mary Livingston Ripley Garden. Tucked into a relatively modest space between the Arts and Industries Building and the Hirshhorn Museum and Sculpture Garden, the Ripley Garden is packed full of unusual trees and shrubs as well as annuals and perennials. It was dedicated in 1988 to honor Mary Ripley, who founded the Smithsonian Women’s Committee (she was the wife of the Institution’s eighth secretary). It was designed by Hugh Newell Jacobsen, FAIA, and the Smithsonian’s Horticulture Services Division. The entrance area to the Ripley Garden on the Mall side. The raised garden beds are laid out in a curvilinear pattern that invites the visitor to explore and keeps you from seeing all the garden has to offer at once. They also offer the advantage – to the plant material – of making it less likely visitors will step into the beds (which of course means the Horticultural Services Division has to climb up carefully to tend to the plants!). I was surprised by the large amount of tropical plants I saw, but presumably the banana plant shown below is one of those that is hardy in our Zone 7 climate here. Tropical plants, including Muso and Phormium, in the Ripley beds. An ornate 19th-century cast-iron fountain is complemented by similar benches, lampposts, and stands for hanging baskets throughout the garden. A 19th-century cast-iron fountain is at the center of the Ripley Garden. 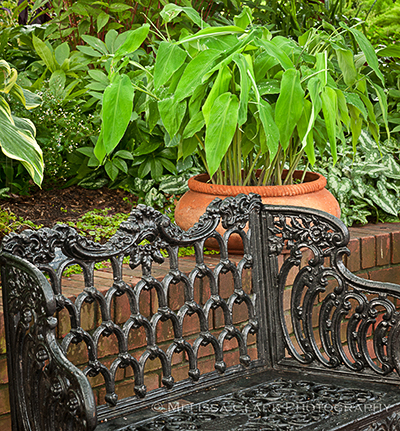 One of the many ornately designed wrought-iron benches, with varying designs, that offer visitors a place to sit. My visit was in early July, not a peak time for gardens struggling with the heat of a Washington summer. But in addition to the tropicals and annuals I saw, there were other spots of color along the way in the form of lilies and Echinops, complete with bees. 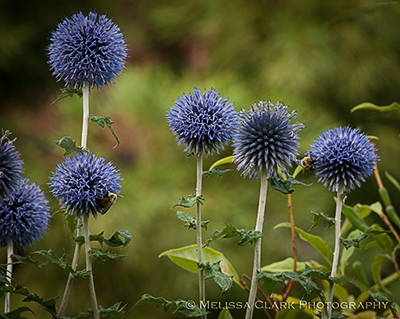 Echinops with bees in attendance at the Ripley Garden. 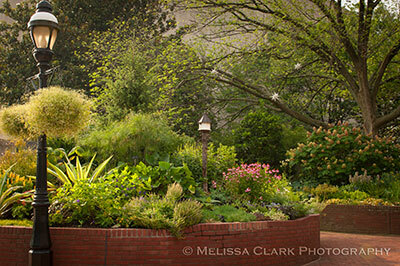 If you’re visiting Washington, don’t miss this small gem of a garden just off the Mall. 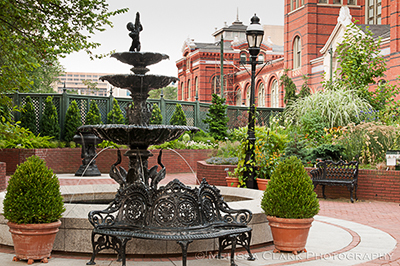 The Enid Haupt garden – to be the subject of another post – is justly famous. The Ripley Garden, however, offers much more in a small space, so put it on your list of sites to visit! 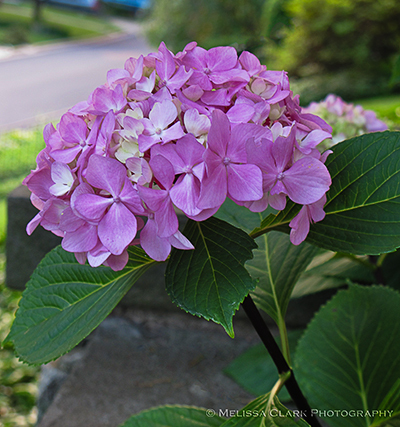 Last week I wrote about “mophead” hydrangeas that I grow in my garden. 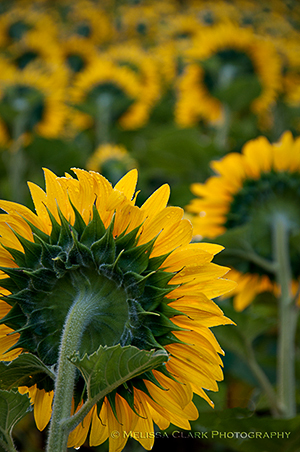 This week is let’s look at some “lacecap” varieties. 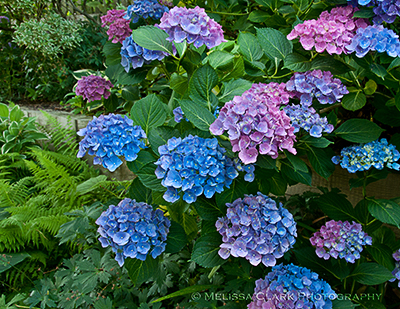 From a design standpoint, I love using this kind of hydrangea in woodland-style gardens for a more natural look; somehow the mopheads look out of place. Many clients I meet haven’t made the acquaintance of these kinds of hydrangeas, and sometimes I gain a convert or two from people who didn’t think they liked hydrangeas at all. Technically speaking, there are at least two kinds of lacecaps. 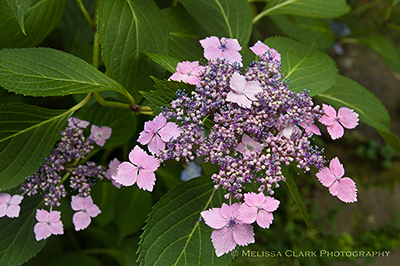 Hydrangea macrophylla has two “sub-species,” the lacecaps (with “composite” styles of flowers) and the “mopheads” with globose-headed flowers. (A valuable guide to hydrangeas is the reference book Hydrangeas, A Gardener’s Guide, by Toni Lawson-Hall and Brian Rothera, to which I am indebted in trying to explain this distinction). 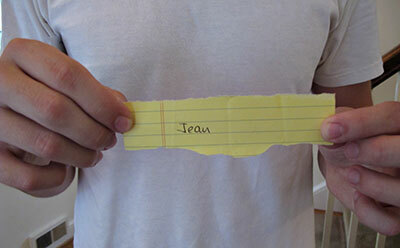 I’ll begin with my favorite. Hydrangea ‘Lanarth White’ is a stunning lacecap in my garden. 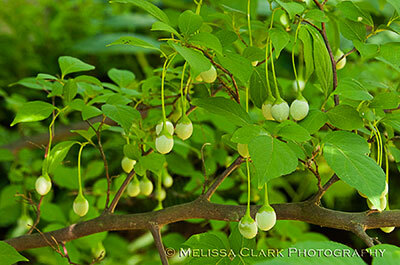 I grow two of them in front of three dark, tall cherry laurels next to my deck. Except for this year, when the snows hit them hard, they have a fairly upright habit, since their flowers are lighter and airier than the big mopheads’ blooms. 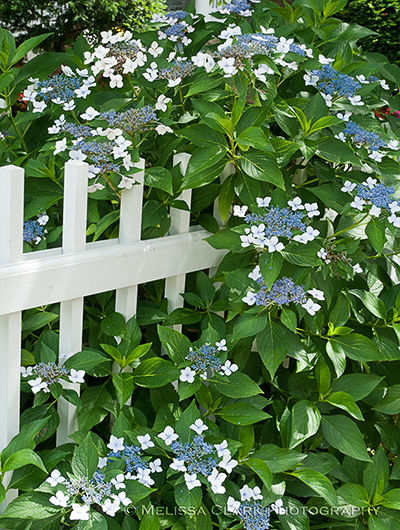 This hydrangea is more sun-tolerant than most, and easy to find in the trade. Its’ tiny fertile ‘true’ flowers, grouped in the center of the corymb, are blue in my soil and provide a nice landing platform for insects looking for nectar. The other non-serrata lacecap that I grow is ‘Lilacina.’ This one tends to get tall and leggy so periodically I take out some of the largest canes in an attempt to keep it in scale. Interestingly enough, its blooms begin as pink, then change over to the blue you see above. 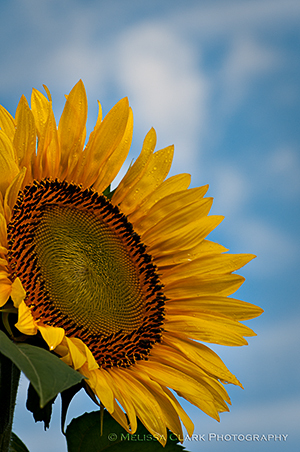 Here’s one of the initial flowers. The initial color of 'Lilacina's' blooms in my garden is pinkish. 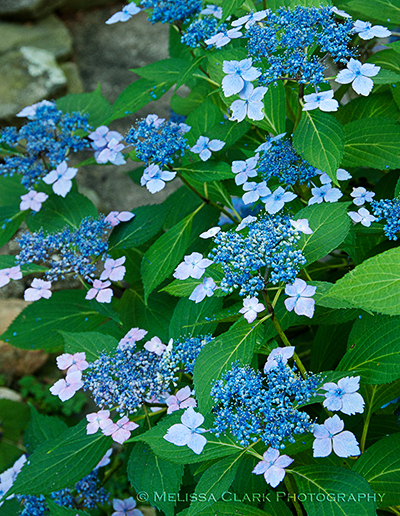 Apart from the Hydrangea macrophylla lacecaps, there are the Hydrangea serrata varieties, native to the woodlands of Japan and Korea. 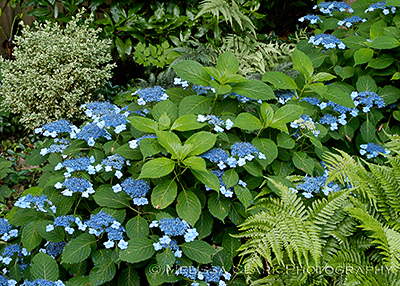 ( These are also sometimes listed as H. macrophylla subsp. serrata.) They stay smaller and are reputed to be more cold-hardy, although this is a matter of some debate among experts. My personal favorite in this group is ‘Blue Billows,’ shown below. 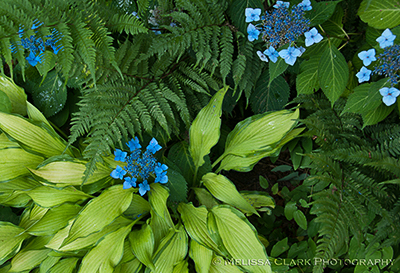 'Blue Billows' in my back yard, with ferns and a variegated boxwood in the background. The blue color of its flowers is quite intense at the beginning. Shown with Hosta 'Pineapple Upside Down Cake' and autumn fern. Finally, I have a few of the newer Japanese imports – one called ‘Purple Tiers’ and another called ‘Diadem.’ Their flowers are smaller and the infertile ones closer together. If you plant these in your garden, place them where their subtle, delicate beauty can be appreciated, for the flowers are fleeting. 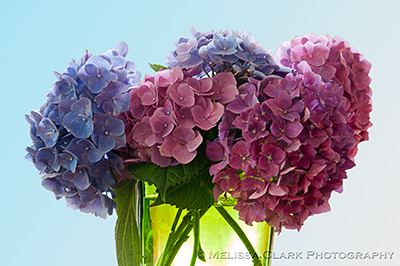 Hydrangeas from my garden, given as a present to two friends celebrating their wedding last week. Most people would not use hydrangeas as foundation plants, but I am not most people. This is a tribute to one of my favorite shrubs, which grace my north-facing front yard in foundation beds (interspersed with cherry laurels for some evergreen staying power in the winter) as well as beds on the east and south sides of the lot. I have half a dozen or more kinds of hydrangeas on my property, and this year some of them seem to be eating the house, thanks probably to the good start they got during Snowmaggedon and a wet spring. 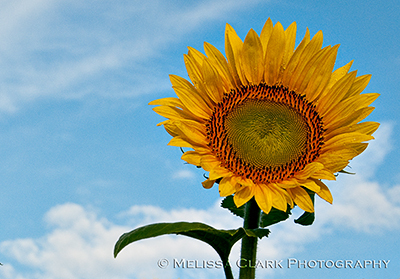 In a post several months ago, I picked this photo as one of my favorite shots of my garden (and it still is). Behind the bench you can see two Annabelle hydrangeas, but I will confess that they are there primarily because a friend recommended them as remarkably drought-tolerant. She was right; despite the competing roots of my old crabapple tree, the Annabelles soldier on without supplemental water. 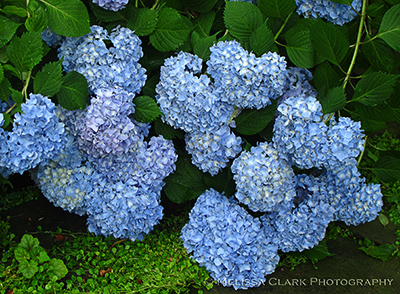 But I prefer the Hydrangea ‘All Summer Beauty’ shrubs next to the house, because of the differing shades of blue and pink they provide as grace notes to the otherwise muted shady palette of my north-facing front yard. Yes, they look like sticks in the winter, but I don’t care. Right now a huge one is in a holding bed in back of the house while my steps and stoop are being rebuilt and we will see if it survives. 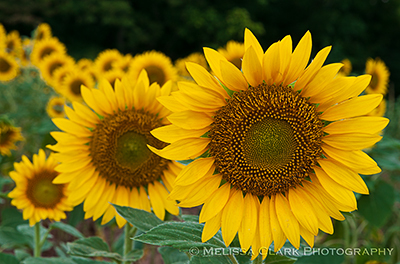 Here are some of the flowers as it started to show color in the spring. 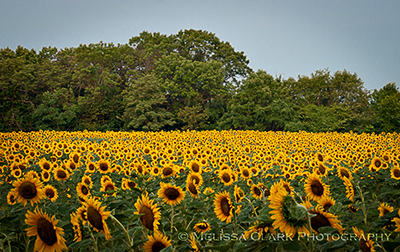 'All Summer Beauty' as it starts to color. And here it is in early summer, bowing under the weight of its enormous flowers. 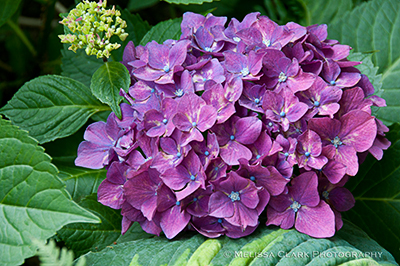 One of the reasons I decided to write this post, however, is to talk a little bit about some of the hydrangeas I grow that you may not see every day. Let’s start with the mopheads. First is ‘Nigra’, whose black stems and pink blossoms make up for the fact that it isn’t particularly vigorous. I grow it primarily for the stems, next to an aging daphne in front of my bench under the crabapple tree. Hydrangea 'Nigra' has black stems that set it apart from the other hydrangeas I grow. I grow another hydrangea called ‘Forever Pink,’ primarily as an experiment because our soil is so acidic (I wanted to see if it would stay pink). Maybe it should be renamed ‘95% Pink’ for this area. In our soil, 'Forever Pink' has a purplish cast to it but is still a knockout. Then there is ‘Blue Danube,’ which I think is really my favorite. I bought it years ago, via mail-order, from Wilkerson Mill Gardens. Unfortunately, the last time I checked, they didn’t appear to be carrying it any more, so if I want more I will have to resort to cuttings. I have two specimens, growing in part-sun, part-shade in the back yard, and I can’t believe the colors and the shape of the individuals florets. 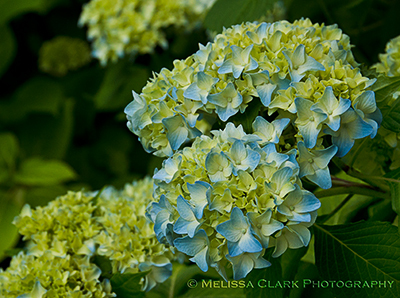 'Blue Danube' is my favorite mophead hydrangea. 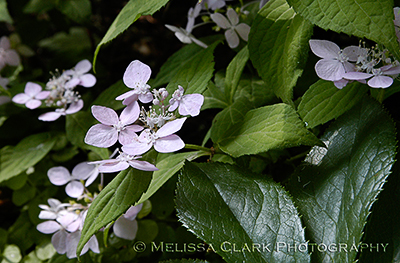 In my next post, I’ll share my favorite lacecap hydrangeas with you. 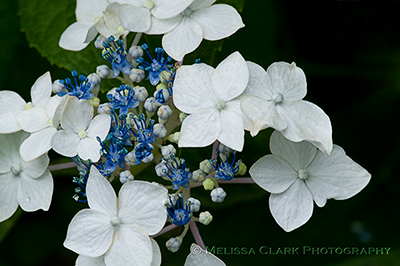 But before I close, I would like to invite those of you who love photos of hydrangeas to visit Britt Conley’s blog (The Photo Garden Bee), where she has a recent post with some absolutely gorgeous photos.